Portrait of a Madelinot who is a lobster fisher... and a lot more! Denis Cormier has been captain-fisher for more than 38 years. He is sharp as a tack and always greets you with a smile. His profession is a family legacy. It comes naturally because, on Les Îles, there are fishers in every family tree! Denis was barely 15 years old when his father introduced him to fishing during Saturday outings at sea. During school breaks, he also went scallop fishing with an uncle. His love affair with the sea was well under way. "I belong on the water. 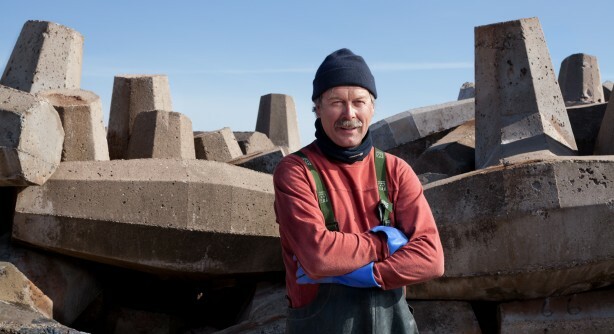 I can't see myself anywhere else"
Denis à Johnny - on Les Îles, filiation is often indicated by adding the surname of the father - goes fishing for lobster in the waters off the coasts of the archipelago. Accompanied by fisher-helper Denis à Roger Arseneau, he steers his Kakawi out to sea. This year, like his 324 fellow fishers, Denis can use a total of 273 traps. No more. The rule is strictly enforced. Lobster from Les Îles recently obtained the MSC certification. It certifies that the fishery is sustainable. Moreover, the provenance - and the assured quality of the product - can now be traced with a tag that's attached to each lobster. The season usually starts around the first Saturday in May and runs for nine weeks of hard work. Sunday is the only day off, but, more often than not, it's the day for repairing gear, resupplying the boat or doing administrative chores. In late July, when the season ends, when the holding tanks overflow and visitors continue to savour the famous shellfish, Denis is already getting ready to go fishing for halibut, a giant ground fish that's caught with a hook and line. In recent years, Denis has also been going out for red tuna. This great fish is a real test of patience and endurance; reeling in a red tuna can take more than three hours! "To be a good fisher, you need patience and a great deal of passion for the job. And nowadays, it also takes a lot of courage, because fishing is not what it used to be." Compared to what it was in the parents' days, the fisher's job has changed quite a bit. Given the regulations and technological demands, Denis thinks that his father, who was an accomplished fisher, probably could not do the job today. When the fishing season comes to an end our fisher becomes a hunter for leisure. In the fall, Denis will go hunting for small game, with his two brown Labradors, Bozo and Castor. They'll be on the lookout for long-tailed ducks (Kakawi), a species of wild duck that Denis is particularly fond of. "Happy as a dog in the back of a truck"
Meaning: "Happy as a fish in water." Denis also goes hunting for harp seals during the month of March, when the ice floes bring the herd in the vicinity of Les Îles. The seal hunt is an ancient tradition with Madelinots. However, over the last few years, the hunt has been the target of a anti-hunting campaign, and most of the markets have disappeared. "The seal hunt is a necessity. Here, around Les Îles, there are so many seals they are eating us up. Where's the logic, when we know that there is a market demand for the oil, the omega-3, the meat and the fur, and we know also that the seals are depleting the fish stocks?" Lobster? Of course Denis eats lobster! After all these years of fishing the shellfish, Denis still loves to eat lobster. He is very proud of the lobster fished around Les Îles. He says its unique good taste comes from the fact that it lives on a rocky bottom where there are no muddy areas. Denis says lobster should be served lukewarm, or even the next day, when it has had time to become even more savoury. But who can wait that long?